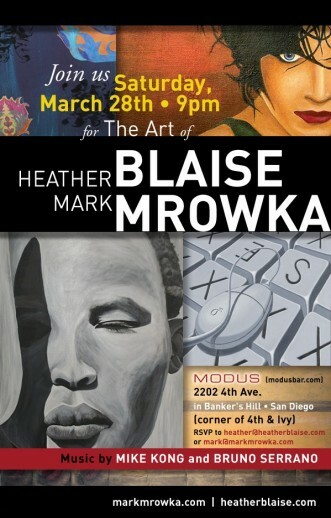 Don’t miss out on the artwork of Heather Blaise and Mark Mrowka, opening Saturday, March 28, at Modus, located in Banker’s Hill @ 2204 4th Street. How long have you been painting? When did the spark begin? I’ve been painting since I was a child, so I would say the spark began then. All my mom had to do to keep me quiet and occupied was give me a piece of paper and a pen. I’d be busy for hours. I studied in school. Instead of graduating like everyone else, I applied to an art school that allowed you to earn your graduating credits through art fundamentals, design, and computer graphics, luckily I was accepted. Coloring books and Play Dough were my favorite. Only the last 2 years of high school at The Central Technology Art School in Toronto Ontario, Canada. Instead of graduating like everyone else, I applied to this particular school that allowed you to earn your graduating credits through art fundamentals, design, and computer graphics; luckily I was accepted. In the 10th grade I had an art teacher that I could not get along with. His name was Mr. Bugaliskis. We argued incessantly. One day he sat me down and had a really empowering conversation with me. He told me that he was pushing me because I had talent, not because he didn’t like me or had no respect for me, after that I opened up and learned a lot from him. Traveling inspires me. Submerging myself into different cultures. I just got back from Paris and while there studied a lot of impressionists art as well as the early renaissance period. Even though that’s not my style, I find it fuels the fire inside me to paint. My mind starts swimming with ideas for new pieces. People inspire me as well. Certain people that cross my path lend to my creativity, through conversation and the energy they project. How do you blend your artistic life with your business life? I’ve spent the last 10 years focused on building my business in a way that would give me passive income, basically income despite me having to show up. I’ve been focused on creating enough wealth to allow me the freedom to travel and create. This year I have reached that goal of not having to physically “do” a lot of work on my business. I follow up and maintain, but that takes minimal effort, which allows me plenty of time to paint, write, be inspired and create. 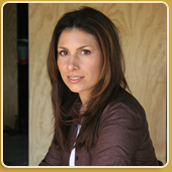 How do you jumble home life/marriage with art and biz? My husband and I make a good team. We’ve created a great balance in our relationship and do what works. We have similar goals, and communication is key. He supports my art and creativity. I’ve been wanting an assistant for years and this year it is finally in my budget! We hired an Executive/Personal Assistant to do all of the things we don’t enjoy doing, allowing us to fill up our time(life) with things that we really enjoy doing. Time is our most precious asset that we can never get back. My philosophy is to enjoy every moment of it as much as possible, thus anytime there’s something I don’t really like to do, I hire someone to do it. I have a whole team of people, such as an accountant, a bookkeeper, a housekeeper, massage therapists, a chiropractor, lawyers, a handyman, writers, website designers, a tailor, property managers, and more! The other thing is, I don’t have to leave the house to go see them, they all either come to the house or I communicate with them on line, which saves time driving everywhere. I get a lot done through delegating or outsourcing and then following up, follow up, follow up. I find I get more completed than the average person because I don’t waste time, and have this team that I’ve built up over the years. This allows me to think a lot, create and then be focused on what’s important in my home life, marriage, business and my art.